Are you thinking of buying a Falcon GT? or would just like to know more about the one you already own? The factory ordered engine and transmission specifications. The factory ordered paint color and trim combination. Which dealer ordered your car, and how many others he sold of that model. So if you're looking at buying a particular car and want to make sure it all stacks up, then for the sake of just $55.00 play it safe and get yourself a STANDARD ACCHS REPORT. Simply email us with your details and the details of the car such as VIN/serial number, SIDO number and we'll tell you the rest. 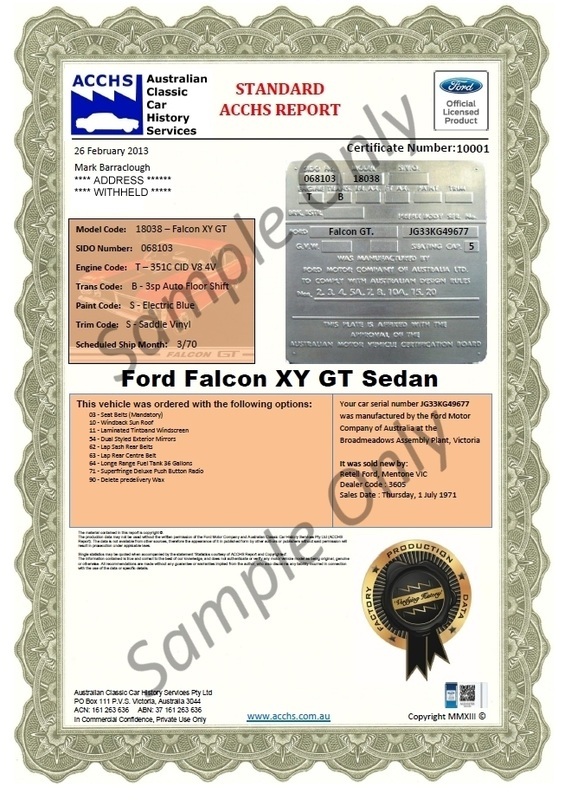 We do not require proof of ownership, and generally we can send you an electronic STANDARD ACCHS REPORT within 48 hours. Simply click here to order your ACCHS REPORT now. Got a question, email us.